Listen To Your Mother — Again! I used to audition a lot. That was back when I was in my early 30’s. I had a little cable TV show and a commercial agent who sent me on a ton of casting calls. I landed a few callbacks and a few international spots, but my acting career never really took off. Maybe I lacked confidence or maybe I was slightly more quirky than super model-y. It didn’t matter, I told myself. I’m a writer first and I’ve got meaningful work. Besides that, in my mid-30s, I hit my stride when I discovered my life’s purpose: to be a mother to Hayden, Charlotte and Catherine. So last year, when my Aunt Ellen, (the poet Ellen Wade Beals) recommended that I audition for the Listen To Your Mother show, I figured maybe now I’ve got a shot. I’m wiser and more confident. I’ve got a lot of funny essays about parenting. I can do this. When I read the Camp Dudley essay to the several women who were holding the auditions, I detected one (Holly, maybe?) had a tear in her eye. But I didn’t get it last year — despite the excrutiating beauty of that little gem of writing. So this year, when I got an email alert about the 2013 auditions for Listen To Your Mother, I brought in a piece of writing, slightly above average, about a tricky little bit of mothering and taking out the garbage with my son. I was the last to audition. There were dozens of people who’d gone through the audition door ahead of me that Sunday afternoon. Through the door, I could tell that the guy in the room just before me was really really good. I sat outside, getting nervous. The room was full of laughter as he left. I recognized the women behind the table from last year, including Holly. But I felt no ill will towards them, just my inevitable lack of success. 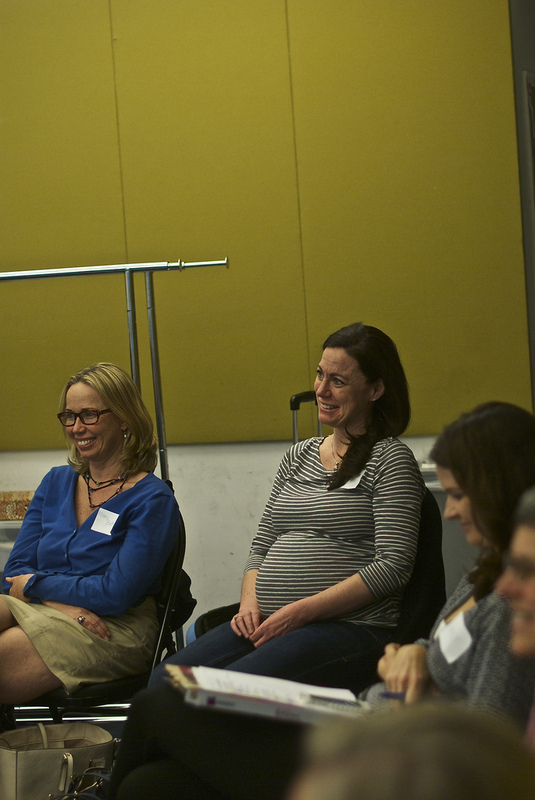 Me and Kim Forde listening to rehearsal the other night (photo by fellow cast member Elizabeth Robinson). I read my piece, stumbling in a few places. I did not feel confident as I walked out the door. After all, the year before, when I had felt confident? Nada. So I was surprised, no, I was ecstatic, when, like a week later, I got a call from Amy that I was invited to be in the cast. I don’t know if my piece is any good, but the show is really really good. And that guy who went in ahead of me, Jamie Fernandez, he’s in the show too and he is really really funny. The brief stories about mothering and mothers are funny, sad, scary, true, and lovely. But don’t listen to me. I am not a good judge of my own writing. This Sunday, Mother’s Day, come to Symphony Space. Tell me what you think. We’ll have a drink at the Thalia. 2012 cast member, Ilana, of Mommy Shorts is doing a brilliant photo challenge with a book giveaway and some tix to LTYM. You have to gocheck this out. And thanks Elizabeth for getting this list of links together! Your writing is really really good AND you’re funny. Can’t wait for Sunday – both the show and that drink afterwards! no, you!!! Your writing is really good and you’re really funny! Can’t wait for the cast party! I can’t wait to see you perform. Thanks for including my giveaway. It was such a pleasure to be a part of the NYC 2012 cast, I’ll be watching you with bells on this Sunday. We feel honored that the 2012 cast is so nice and supportive of our 2013 cast… and I vow to be supportive to the show in 2014 (but let me not get ahead of myself, let me just make it through Sunday!) See you on Mother’s Day, Estelle! Congratulations!! Wish I could be at Symphony Space Sun. – will be cheering you on anyway.